Prisons without rehabilitation programs are not effective for many different reasons. Without rehabilitation, it is just as easy for formerly incarcerated men, women, and children to end up back in prison. Rehabilitation should focus on the individual. Many inmates come from disadvantaged backgrounds and reside in communities that lack socioeconomic, political, and educational resources. For some, incarceration, depending on the facility, offers a chance at educational programs that offer a sense of purpose and life and career skills. The history of prisons nationwide shows a start of programs like these at a certain point and the wellbeing of prisoners goes up after these programs are implemented. Historically, prison newspapers were a huge outlet for prisoners. Prison presses made it possible for the everyday man to become a writer, poet, or editor. Prison rehabilitation programs, including such newspapers writing programs, are a staple of prison life for some inmates and were possible outlets for creativity, pleasure, and leisure. Inmate newspapers are not a new concept to prisons. Some prison newspapers date back to the antebellum era. In 1800, William Keteltas, an incarcerated attorney, created the Forlorn Hope in a New York City prison. Ketelas is credited with establishing prison journalism (1). After about 80 years, prison journalism was a staple to life behind bars. “Worthwhile examples of prison journalism are few and far between not because the possibilities are non-existent but because under the seemingly inevitable unintelligent censorship imposed upon prison journalists, any noteworthy effort is nothing short of a miracle”(2). 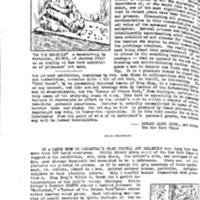 Michigan State Prison, commonly known as Jackson Prison, published The Spectator. The paper was dedicated to inmates and was operated by the incarcerated men. The Spectator featured many different stories such as gossip, sports, and such that one would find in any outside newspaper (3). It is even printed in the prison since Jackson is known for being a multi-industry prison. The paper included creative outlets like poetry and humorous titles that let the men express themselves in healthy ways as opposed to their usual outlets of crime and violence. One inmate wrote a poem titled "From Bad to Verse" with the opening line as "They break my heart, these prison bards". It was a poem about other prisoners. At Jackson, it was a site of creativity because the paper was innovative and expressive in new ways for these men. It let them use their intellect in different ways. Prison journalism gave longtime offenders a great opportunity not only to work in a constructive and creative manner but also to hone in on these skills that they could potentially use later upon release. This of course came at a price. Many of the first prison papers saw great scrutiny as their reporting often took aim at the unfair fair conditions that prisoners lived under. In the New York prison paper, Good Words, author Julian Hawthorne wrote a scathing wrote an article attacking meaningless, make-work jobs stating, “men in jail have killed themselves, or done such desperate acts that would lead to their killing because of the aimlessness of a jail routine” (4). Acts of resistance through journalism such as this was seen as a threat to the prison system and often was sought to be suppressed by prison staff. This could come in form of reassignment of work to a specific inmate to underfunding of newspaper programs at large. If a program was able to succeed, however, the social benefits were abundant. With greater funding for programs, better typefaces could be used to entice readers and increase the overall appeal for all involved (5). Aside from topical contents and increased funding for improved print quality, illustrations rounded out the multimodality of these papers. As literacy was typically lower in prison populations, the addition of pictures in the papers made them more universally enjoyable. 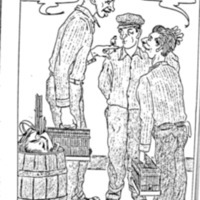 The addition of illustrations to prison newspapers is what truly made the efforts of inmates work visually noticeable. Because prisoners did not have access to photography tools, illustrations were the only way to communicate ideas outside of the written word. As time went on and prison newspapers became larger and more developed, so did the illustrations inside. By 1934 Jackson prison’s The Spectator had become renowned for its captivating images that rivaled the quality of work being done out in the free world. At this time, The Spectator published two reviews from the New York Times and Time Magazine, respectively, that celebrated the illustrative works being done in prisons (6). One piece titled “On The Rock Pile” was a wood carving print that was displayed at a New York Exhibit, as well. The review highlighted not only the exquisite quality of the work but also how that it portrayed prison life. The image itself depicts a prison laborer breaking rocks while the review cross-examines the illustration’s purpose in capturing this moment. Both prisoners were doing a task, but the illustration provided a creative outlet not only for the sake of creating but also informing others of the conditions within prisons as well. In this respect, the many people were already coming recognizing the rehabilitative qualities that artistic outlets such as newspaper illustrations had in prisons. (1) Morris, James M. "Journalism Behind Bars." The Quarterly Journal of the Library of Congress 40, no. 2 (1983): 150-61. http://www.jstor.org/stable/29781973. (2) Editor, A Prison. "Prison Journalism." Journal of Criminal Law and Criminology (1931-1951) 23, no. 2 (1932): 279-81. (3) "Jackson Prison Paper Is 'Best Read' in State." Detroit Free Press (Detroit), January 24, 1937. (4) Morris, James M. "Journalism Behind Bars."151. (5) "Exchange of Criminal Records." Journal of Criminal Law and Criminology (1931-1951)23, no. 2 (1932): 280. http://www.jstor.org/stable/1135951. (6) "Prisoners' Art." The Spectator (Jackson), April 13, 1934.